Surely SK74 and Patric Hornqvist aren’t going at it? Picture from the 2010 Olympics. Team Belarus and the Kostitsyn brothers were first to be knocked out of the tournament, falling to Team Canada 5-1 on Tuesday, May 15th. Sergei Kostitsyn did manage to collect a goal during his short run in the tournament. Also on Tuesday, Craig Smith and Team USA eliminated Roman Josi and Team Switzerland 5-2. On Thursday, Team Finland overthrew Team USA to advance 3-2, knocking out rookie Craig Smith. Martin Erat, who notched a goal against Team Sweden, eliminated Patric Hornqvist and Tre Kronor 4-3. It was announced by Czech GM Slava Lener that Martin Erat does have a concussion, which could potentially affect the Predators in the upcoming season. Although the 2012-13 season is a little over five months away, concussions are a bit of mystery when it comes to treating them properly. That, and Martin Erat’s history of concussions is virtually unknown, so the way his body handles the healing process of a concussion will be on a day-to-day basis. 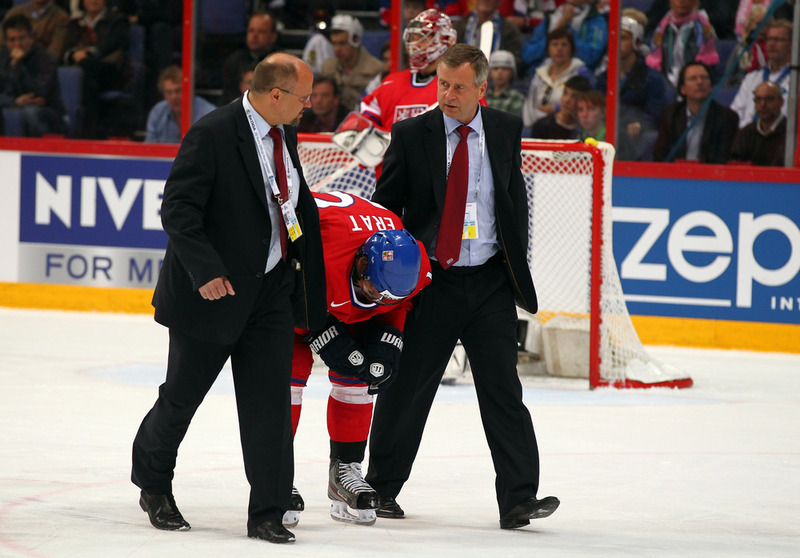 Martin Erat, though his a bit more serious, was not the only player injured during the World Championship. Sergei Kostitsyn dislocated his shoulder during the match between Team Canada after being hit by Kris Russell, a currently St. Louis Blues defenseman. As stated, although not as serious as Erat’s concussion, Kostitsyn will have to sit back a while to let it properly heal. Martin Erat’s agent, Mike Deutsch has just announced that, despite what Czech GM Slava Lener stated earlier, Erat did not suffer a concussion and is simply suffering from a ‘stiff neck’. Good news for both Martin Erat and the Nashville Predators, but we will keep you updated in case the story changes once again. Martin Erat being helped off the ice.